If your business is looking to expand into additional space then a pre-fabricated building could be the perfect solution. One of the most trusted suppliers of top quality pre-fabricated buildings in the UK is Modular Direct. 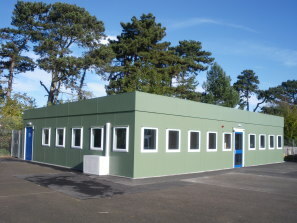 Modular Direct supply a wide range of modular buildings that are suitable for any use from a classroom at a school to an office for commercial premises. All of their buildings are of the very highest standard and made from the finest quality materials and can be supplied bespoke to your individual requirements. Their commitment to excellent customer service will ensure that your requirements are met with a pre-fabricated building that will not only solve your needs for extra space but will complement your existing buildings. Pre-fabricated modular buildings from Modular Direct will allow you to create that much need extra space without the hassle and time scales associated with traditional buildings as they can be installed and commissioned to be working in a much quicker time frame using the latest design criteria that will be fully compliant with current Building Regulations and standards. If you're looking for a trusted supplier of prefabricated buildings within the UK, there is no supplier who rivals Modular Direct. Please contact them today by calling: 01482 881700.